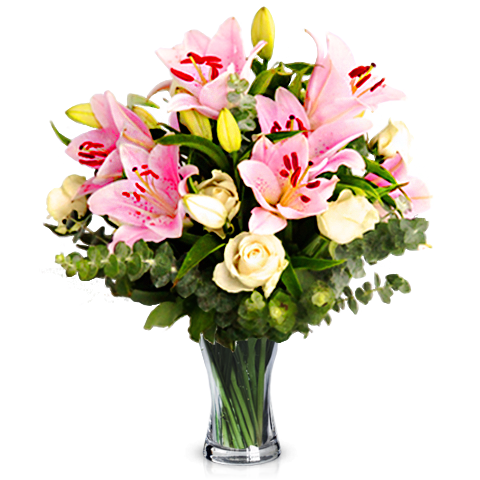 Surprise someone special with this marvellous display of lilies and roses. This truly fine pink flower bouquet is full of happiness and energy, with the power to brighten up anyone’s day when saying "thank you" or "get well soon" or on a birthday. Thank you very much for best services. Arrived on time.recipient very happy with them. Easy to order. Very efficient, on time, and polite. Responsive to questions and delivery made on time. Went the extra mile.! Nice product and excellent service. Beautiful bouquet and great bottle of wine! Beautiful flowers arrived in time. The arrangement was beautiful and flawlessly delivered. Reliable and good quality of the flowers (Rio de Janeiro). No problems. Flowers were delivered when due. quick answer, paypal payment and great quality!